Hi my name is Shay. 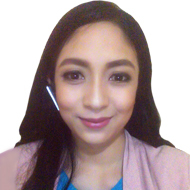 I am a Registered Nurse in the Philippines. I have been teaching English online for 3 years now. I love talking to different people because it keeps me open-minded and always with a fresh perspective in life. My students find me respectful, creative, funny and full of energy. I am here to develop what you want to improve such as speaking, listening, reading skills, basic communication, medical and business English.